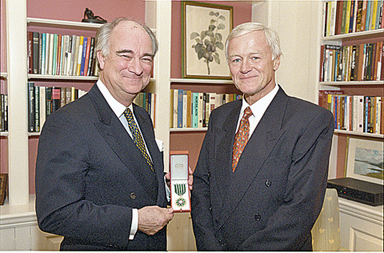 Gerard Defaux, right, receiving the medal as Chevalier des Arts et Lettres, a distinction conferred by France's Ministry of Culture, from Ambassador Bujon d'Estaing. The event took place in 2000 at Nichols House on the Homewood campus. Gerard Defaux, professor since 1981 in the Department of Romance Languages and Literatures in the Krieger School of Arts and Sciences, died in Paris on Dec. 31, 2004. The cause was a brain tumor. He was 67. A lifelong athlete, he had cycled for 30 miles early in the morning on the day the tumor had made itself known in February. Stephen G. Nichols, James M. Beall Professor of French and Humanities and chair of the Department of Romance Languages and Literatures at Johns Hopkins, had visited with Defaux in Paris shortly before his death. Writing to colleagues and students last week to inform them of Defaux's death, Nichols said, "Quintessentially French, though proud of his American citizenship, Gerard embodied the best in each of the two educational systems he served. He was a passionate teacher who inspired generations of undergraduate and graduate students alike. His devotion to teaching did not for a moment prevent him from pursuing his career as a scholar. On the contrary, he managed to make each serve the other. As a result, he published some 25 scholarly books and critical editions (18 of them since 1992), in addition to well over 100 articles. Always one to relish a good intellectual donnybrook, Gerard also wrote review essays that were the antithesis of the bland book reports so frequently encountered in scholarly journals." Defaux was born on May 9, 1937, in Paris, where he studied at two prestigious academies, the Lycee Henri IV and the Ecole Normale Superiere de Saint-Cloud. A passionate scholar of Renaissance literature, he did his doctoral work at the Sorbonne on Francois Rabelais and the Sophists under the direction of the most eminent 16th-century scholar of the period, V.-L. Saulnier. After receiving his doctorate in 1967, Defaux began his career as assistant professor at Trent University in Peterborough, Ontario, Canada, and then, from 1969 to 1979, taught at Bryn Mawr College, where he was promoted to full professor and served as director of his department. He was professor of French and director of undergraduate studies at Yale University from 1979 to 1981, when he left to join Johns Hopkins. From 1981 to 1986, he served as chair of the French Department, which later was incorporated into Romance Languages and Literatures. At the time of his death, he was director of graduate studies for French. Among Defaux's many honors were Guggenheim and American Council of Learned Societies fellowships. The French government awarded him the Palmes Academiques in 1997 and in 2000 made him a Chevalier des Arts et Lettres. In addition to his athletic pursuits, which included jogging, squash and swimming as well as cycling, Defaux was a fan of jazz and classical music, especially works by Italian baroque composers, Mozart, Beethoven, Faure and Satie. He is survived by his wife, Anne; his son, Olivier; his daughter, Emmanuele; and four grandchildren. The funeral took place on Friday, Jan. 7, at Pere Lachaise cemetary in Paris. A memorial service will be held in early February on the Homewood campus, and a one-day colloquium in Gerard Defaux's honor will take place on Friday, March 4, also at Homewood. GO TO JANUARY 10, 2005 TABLE OF CONTENTS.